Curtains, drapes, etc. – are one of the hardest things for me in decorating my house! It shouldn’t be, but for some reason, it is! For a couple reasons: I am very indecisive, store-bought curtains are expensive, and fabric can be expensive too! But when I finally decide and finally find something affordable, I LOVE them! These are the curtains that I have in my living room. I wanted to add a pop of red in my living room, couldn’t find any material I liked, but I did find some curtain panels at Target that I loved. BUT, they were $29.99 a panel and I needed FOUR . NOT in the budget at all! I even bought one and brought it home “just to see if it worked” and of course I loved it, but they were a little too wide/had too much material. When I returned the panel back to the store, I checked the curtains again and they were marked down to $14.98 a panel – woohoo! Gotta love Target clearance! And I figured out that I could take 1 panel and cut it in half longwise making one panel into TWO panels! So I bought 2 panels for $30 total, split them into FOUR panels, and I love them! And $30 for 4 panels – very budget friendly! Here are the curtains in my eat-in kitchen. Now some more inspiration pictures for you! Hello Newman made these curtains from tablecloths! Here’s an easy way to make a “pocket” on the back to hang your rod. By the way, she made these curtains from a bed sheet! and bold striped curtains from from Yellow Cape Cod. Hang them HIGH. Don’t hang the rod the same height as the window, hang it quite a few inches above. Hang them LONG. Don’t make your curtains too short. They shouldn’t just skim the floor, they should “puddle” just a little. Hang them WIDE. 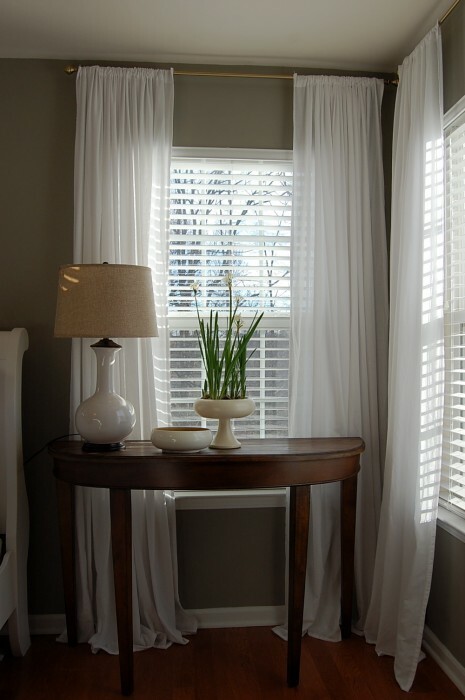 Your rod should extend way past the edge of the window so that your curtains are actually hanging more over the wall then over the window. Let the sun shine in! This picture from Pottery Barn demonstrates all 3 tips – see I told you, designer! Alison, at House of Hepworth’s just posted a great tutorial on how to make your own lined curtain panels. I am in the process of looking for/making curtains for my dining room so we will be talking about this subject again very soon! 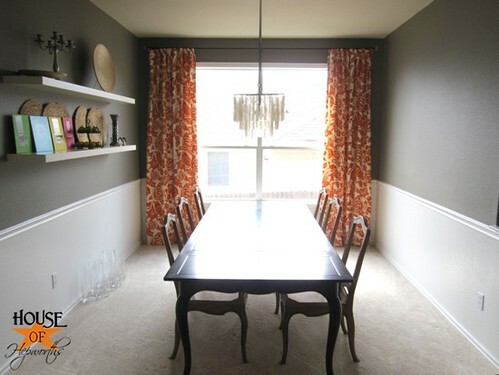 How you accessorize your house with curtains on a budget? 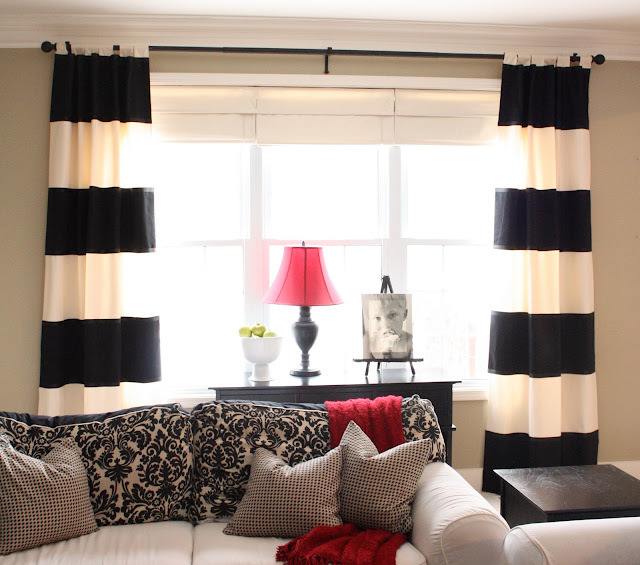 Been thinking of making those black and white striped curtains for a while! And hanging curtains high and wide makes SUCH a difference, really is amazing! I need tension rods in two lengths. 96″ space and 76″ space. Curtains for female teen’s room should be full and cover 48″ length. I could sew a strip of contrasting colored fabric within a shorter panel. She mentioned lime or chartreuse and blue. Any idea where I can order these?